Malaysia, Is Chinatown Kuala Lumpur Special? Can you name a place that shocks all the senses and puts them back into place in a short second? 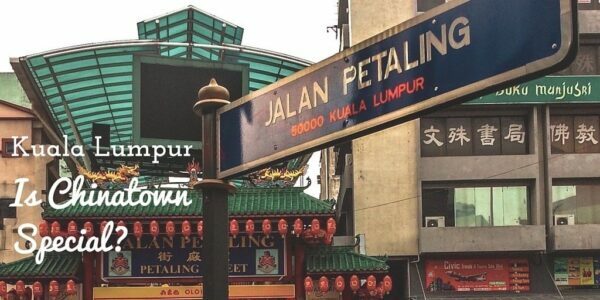 For me, that’s the area of Kuala Lumpur, Malaysia’s Jalan Petaling that’s also known as Chinatown. Through our times passing through Malaysia’s most populous city, this is always a spot that we have to walk through. Lots of people first look at the Petronas Towers and the KLCC area and I understand that. Seeing those almost supernatural buildings is something that we should include in our Kuala Lumpur itineraries but in Chinatown, the scene is interesting in a different way. Let’s take a look behind the scenes before jumping into my Chinatown experience. There are Many. What are Yours? This Chinatown Kuala Lumpur travel guide is part of our series on Malaysia Travel and Southeast Asia Travel. It was originally created on November 20, 2015. It has been maintained and updated (as of December 27, 2018) to reflect current viewpoints and travel trends. When visiting Malaysia, it’s hard to ignore the country’s diversity and I’ll always think fondly to rides on the KL Monorail where Malay, Chinese, and Indian locals would be speaking a variety of languages that threw my head in a tailspin. Petaling Street is the center of Kuala Lumpur’s original Chinatown and where lots of farmers came to have their crops ground into flour. Maybe that’s why the noodles found here are so good and after traveling here a couple of times, I can vouch for them. 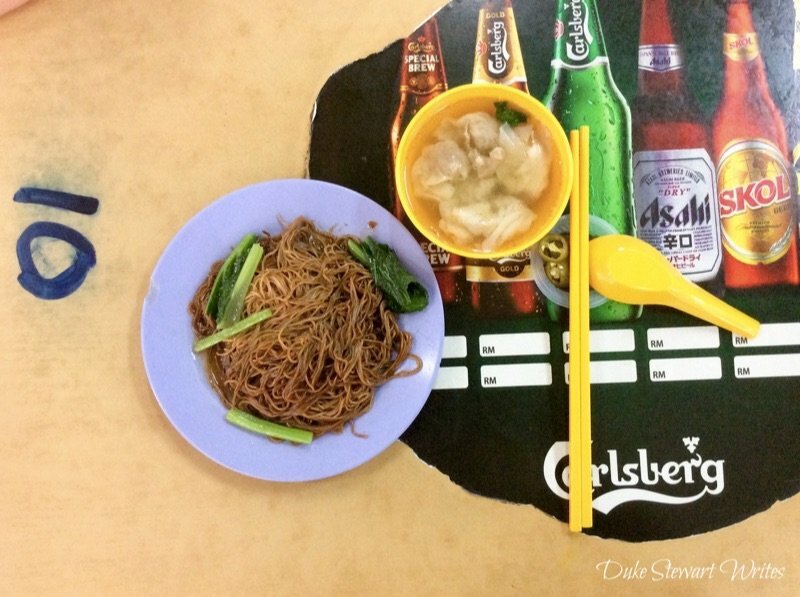 The food is a big part of the fun but a walk through Kuala Lumpur’s Chinatown exposes much more worth sharing. Let me take you around. My wife and I arrive at Jalan Petaling (Petaling Street) early enough to beat the crowds and have a look at this vibrant street before the action gets going. The heat has already pushed sweat through whatever shirt I’m wearing and will make the way through Chinatown into a humid struggle. The place is about as empty as I’ve ever seen and honestly, I’m happy about it. Lunar New Year approaches and there are tons of lanterns hung up to commemorate the upcoming festivities. In a few days, this place will be full but for now there are very few tourists walking around in this quieter version of Chinatown. It feels like a “behind the scenes” experience where a director will soon tell us to clear out for the stars. We walk for as long as possible and try to explore the relatively empty streets. No matter where I am in the world, temples are a great place to start the morning because they are another attraction that clogs up during peak hours. Early visits mean you’ve got the run of the place and can probably get a whiff or two of the morning’s first sticks of incense. I take it in and bow my head to show respect towards the all-powerful before our next move throughout the rest of Chinatown. We’ve lasted as long as we could in one of Kuala Lumpur’s best places to find a good meal. Chinatown favorites include hokkien mee, a tasty seafood noodle dish that dazzled our taste buds in Penang. I’m in the mood for one thing today and won’t stop until I find it. An old favorite (won ton mee) is the only dish that I’ll settle for today, but it’s so difficult to resist everything else around. The smells are everywhere and trying to convince me that it’ll be just a taste, like all those dealers are probably saying on every Saturday or whatever day that drug deals go down. You can’t blame me for comparing this experience to a narcotics binge because the distractions won’t stop popping up in the form of buns, dumplings, and all the other heavenly eats found in Chinatown. Then there are the covered areas where we stumble upon low hanging roofs and fresh-cut meat being thrown into soups and stir-fries. 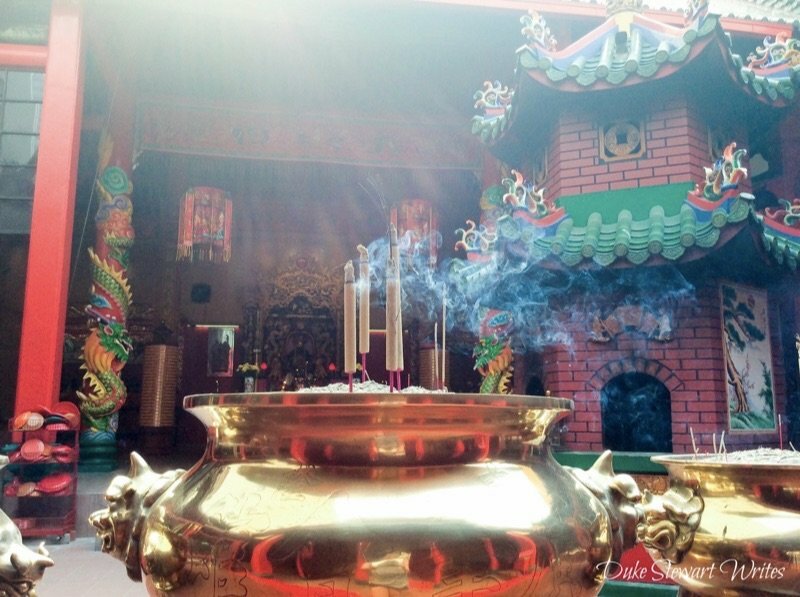 We pass through the fog of delicious smells and reach Jalan Hang Lekir in the area shadowed by the Confucian Private Secondary School. I’m hot on the trail of won ton mee and know that it’s easy to find here. Some restaurants in this area advertise it with variable spellings but a similar, wonderful taste. We sit down at a table inside a small hawker mall where tables are numbered and divided up by the vendors. A lady comes up and we order before chugging some water to cope with the unforgiving heat. Chinatown is waking up as people start making their way out of nearby hotels and into the mix of things. There’s still some time before things get too chaotic but most importantly, the food arrives. I forget about the speedy food service here in Chinatown and in most hawker malls that rule food scenes throughout the country. My wife and I slug down a few gulps of water and if it were later in the day, this spot would be the best for having a Carlsberg while digging into our meals. The perfectly cooked egg noodles are almost too easy to eat in two or three chopstick runs. The Chinese cabbage (bak choi) combines crunch with the almost too tender slices of pork and that oh so perfect sauce. Reflexes battle brain cells and the whole plate is in danger of being consumed without much though. Mindful eating is difficult with something that is this delicious but my thoughts prevail, enjoying and appreciating every bite. The whole spectacle of consumption has masked the crowds that are starting to arrive in Chinatown, as it’s now about 10:30. We pay and head towards the shops that are getting started and if one wants to shop in KL, Chinatown should be your first option. Some people get scared away because of all the “genuine copies” aka fake stuff that floats around here. I’m really not impressed with the fancier shops and am more interested in entering a place, trying to leave, and being begged to buy something at a more than reasonable price. We might buy a bag or some souvenirs but no matter what, this will be a fun experience. Why wouldn’t anyone come to Chinatown for a nice walk, some delicious food, and a surreal shopping experience? We eventually leave Malaysia and even months later, I’m struggling to get over that marvelous country and hope that wasn’t my final visit to Chinatown and Kuala Lumpur. I’ve fallen in love with so many places and why does this always happen to me? I’ll be sitting down and enjoying a wonderful conversation when it just pops up and interrupts my thoughts. Am I crazy in trying desperately to wipe away the nostalgia when I’m sitting in a comfy living room listening to tunes on a quiet evening, feverishly writing about it? I can’t be alone in declaring all the world’s wonders to be such precious and wonderful places, can I? 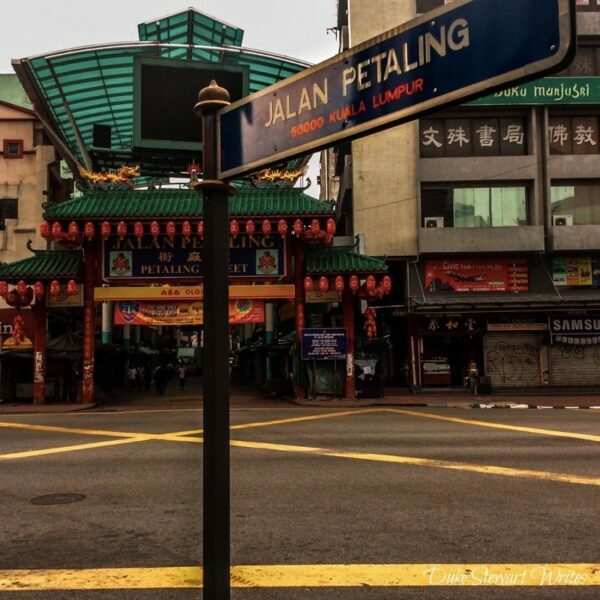 If Kuala Lumpur’s Chinatown is one of my many special places, what are yours? Do you have one or many? I’d love to know about your special place. Does it center around food or something else? Let me know in the comments section. I’d love to hear from you! Lucky you, spending Christmas in such a wonderful place! I hope you enjoy your time there, Jub. Grab some noodles and something good to drink while you’re in there! Take care man. I wouldn’t argue about the food considering Chinatown is a top spot for hawker delights but it’s a bit disappointing that the bazaar has become a haven for fake goods. I’m comparing this directly to my visit to Bangkok’s Chatuchak Weekend Market where authentic quality goods are sold at reasonable prices. I was astounded that I could find really nice clothes and handicrafts that are made in its country of origin i.e. Thailand and sold by the people who actually made them. The fake goods don’t bother me so much but I get it that we should be supporting locally made things in lieu of fakes. I appreciate your thoughts on that. Thanks for stopping by, my friend. I hope you enjoyed the read! It’s really a nice and useful piece of information. I’m satisfied that you simply shared this helpful information with us. Nice write on Chinatown. Well, apart from exploring on your own, seems like you hit all the general places. The next time around, you should try to get a local to guide you around as there are in fact many nooks and crannies which are simply incredible to explore. As for food, Chinatown’s food has degraded by many folds as they currently employ foreigners to man the food stalls therefore, many have stopped going there. However, the tourist and foreign workers still indulge in the local food scene so it looks pretty busy and popular. 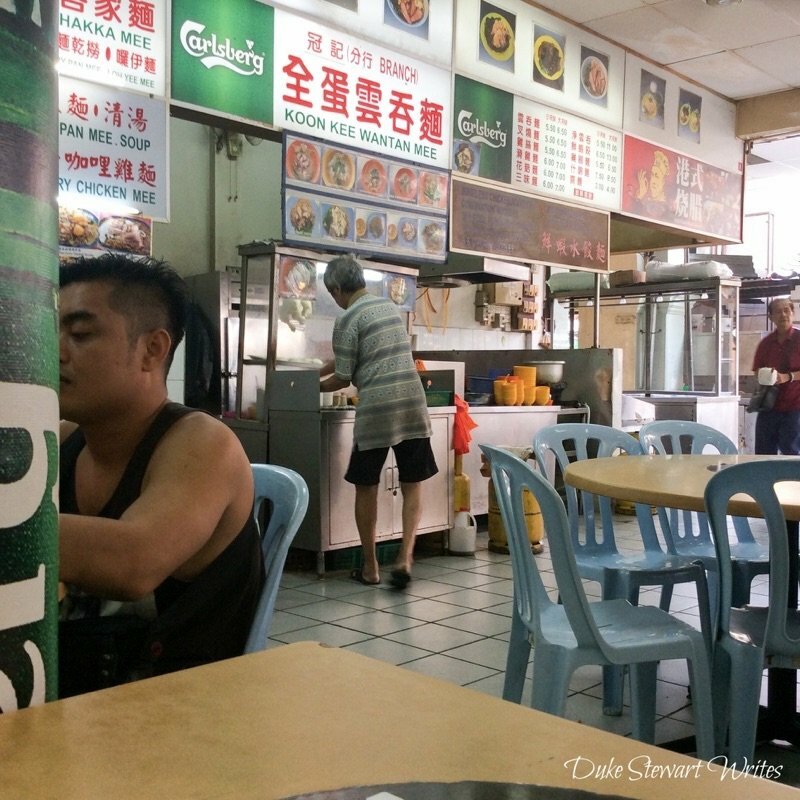 Just for the record, “Chinatown favorites include hokkien mee, a tasty seafood noodle dish that dazzled our taste buds in Penang” – Hokkien Mee is just a Hokkian style black sauce noodle which is garnished with your choice of add-on’s. It’s rarely or never called seafood noodle 🙂 But I once ‘used’ to enjoy it when the original cooks were frying the noodles. Not any more. Thanks for stopping by! I guess we’d need to employ a local to help us with certain things in KL, huh? I did some looking into Hokkien Mee and it looks like it differs between Penang and KL. The one I was referring to in Penang so apologies for the mistake. Anyway, I appreciate you leaving a comment and hope you have a wonderful weekend! 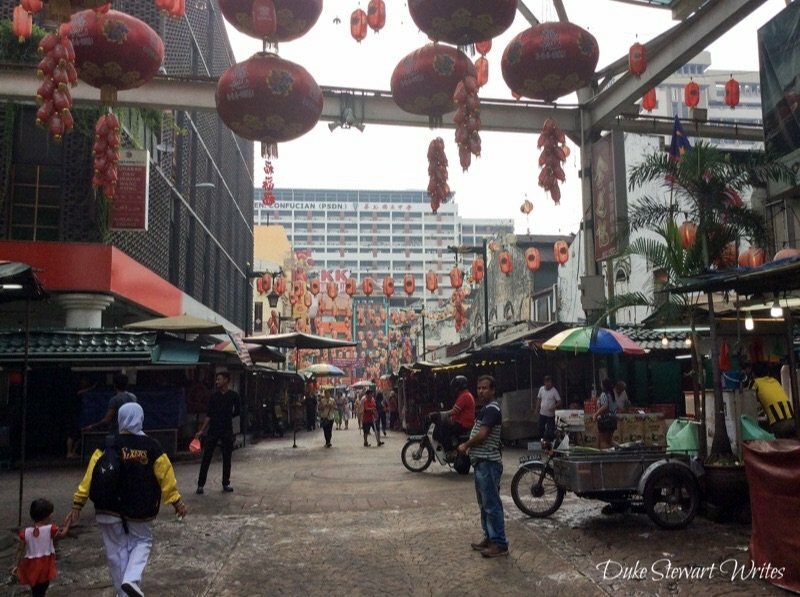 We stayed in Chinatown for days when we were in Kuala Lumpur and it was one of the most interesting places from the food to the people to the markets. We ate at a chicken rice place really close to Chinatown which was recommended to us by the staff at our hotel which was amazing. Apparently it was one of the longest chicken rice restaurants in the area. Your photos bring back memories of our time there, and hopefully we’ll visit again! That egg noodles look delish! I had the pleasure of staying near Chinatown but it seems like IN is the way to go, huh? One of my friends is staying there as we speak and he’s in love with the place. I’m with you on hoping to visit again. Chinatown is the best! I really appreciate you stopping by to comment, Samantha. You and Yeison take care and have a wonderful week! It is good to hear your perspective to remind me about all the good things about KL, a city I am trying hard to like. Thanks. I appreciate it. Thanks for sharing and for commenting. Take care.